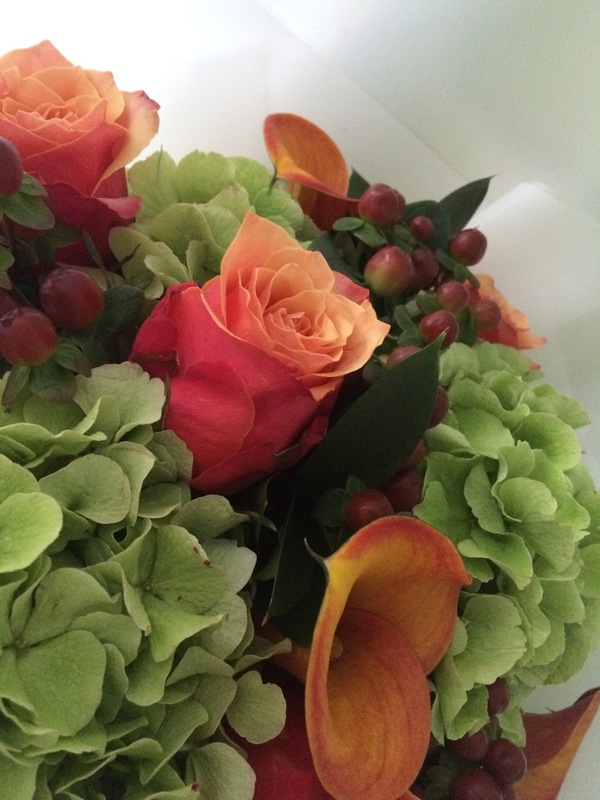 There really is nothing quite like having flowers delivered to your door to perk up your day. 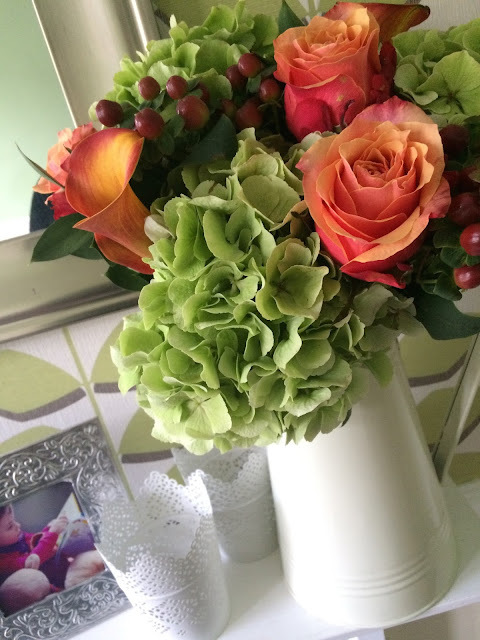 I've been incredibly busy of late, so when the lovely folk at Debenhams were kind enough to send me a beautiful bouquet of flowers I was over the moon! The flowers arrived wrapped beautifully and safely encased in a large box (which Poppy promptly stole, decorated with stickers and turned into a 'rocket'). Once unwrapped I prepped them as per the intrsuctions on the flower food sachet and decanted them into my trusty cream jug. I went for the Designer Autumn Rose Bouquet which I knew would look great against the greens in my living room. I just love the big plump hydrangeas which contrast beautifully with the corals and oranges of the roses and lilies and then the deep red of the berries. There is something truly special about receiving flowers, I never really appreciated it when I was younger, but nowadays it's one of my favourite things. 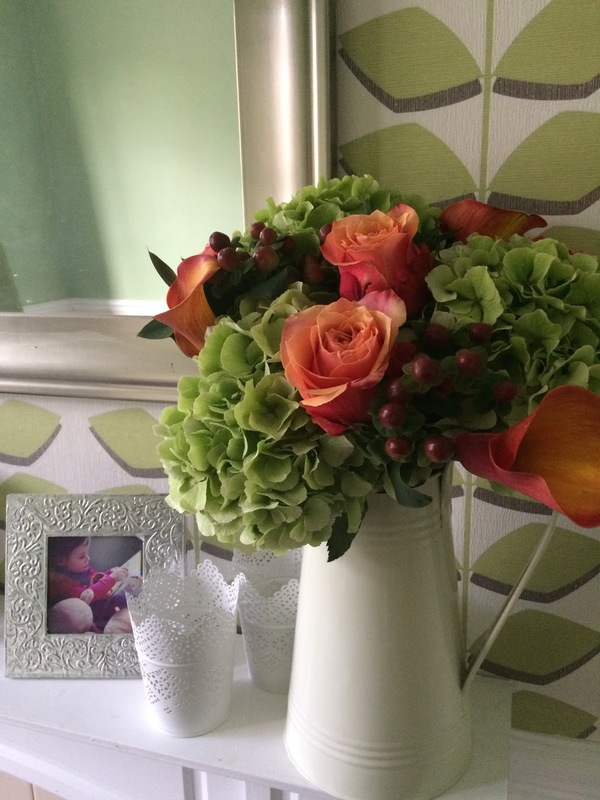 I've got an exclusive discount for you thanks to Debenhams - enter DFBLOG25 at the checkout and get 25% off all bouquets (excluding the 'flowers by post' range) - why not treat a loved one, or yourself for that matter! And now is the perfect time to start thinking about Christmas Flowers or check out the range of Christmas Hampers which make great gifts, especially for those quite tricky to buy for (I'm looking at you mum). Beautiful flowers!! Love pink rose.